The Los Angeles Rams solidified themselves atop the NFC West with their 33-0 win over the Arizona Cardinals from London on Sunday, as the emergence of former No. 1 overall pick Jared Goff has helped the Rams to a 5-2 record through Week 7. Goff completed 22-of-37 passes for 235 yards and one touchdown against one interception, while Rams star running back Todd Gurley torched the Cardinals’ defense for 106 yards and one touchdown on the ground. Cardinals QB Carson Palmer took an early exit from the game in the second quarter due to a left arm injury, bringing backup Drew Stanton off the bench and into the game. Stanton struggled to get things going for Arizona, as he completed just 5-of-14 passes for 62 yards and an interception. Following Stanton’s lead, Cardinals running back Adrian Peterson had quite the opposite performance against the Rams compared to his strong debut in Arizona last week. He amassed just 21 rushing yards on 11 carries. Keeping the Cardinals from taking flight, Rams’ Mark Barron and Lamarcus Joyner both logged interceptions in the contest. With that, we give you our PFF exclusive takeaways from the contest for each team. 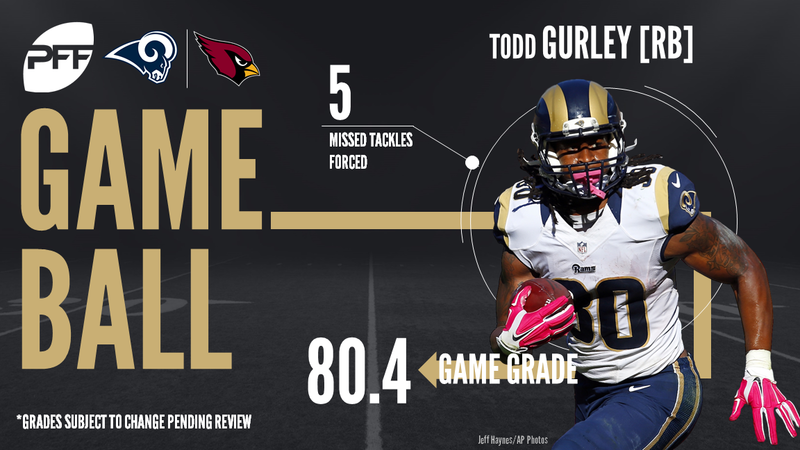 Gurley continued his strong season, with his fourth 100-plus yard rushing game in five weeks. He gained 62 yards after first contact, an average of nearly three yards per carry, and forced a season-high four missed tackles. He added another four catches, 48 yards and a missed tackle as a receiver as well. Overall, it was a pretty mediocre game for Goff through the air. His only target on a deep pass was broken up and nearly intercepted by Antoine Bethea. He completed just 4-of-10 passes targeted 10-plus yards downfield, with most of the rest coming on short, quick passes or dumpoffs. Accounting for drops and throwaways, his overall adjusted complettion percentage was just 67.6 percent. However, Goff did have the nice touchdown run on the read-option zone play to put points on the board. Ogletree had a strong all-around day, as he posted three defensive stops and two QB pressures, one of them the aforementioned hit which knocked Palmer out of the game. He was also excellent in coverage, as he did not give up a reception on five targets and came away with an interception. It says something about the kind of player Donald is that it is almost disappointing he tallied “just” three pressures. However, he was still of course his normal, effective self, notching a sack and a hit on the quarterback to go with two run stops. The Cardinals sorely missed Andre Ellington today, and nowhere was it more visible than on third down passing situations. This is not an area Peterson has ever shined, and today he showed why with two drops and a third target that was nearly intercepted because he allowed the linebacker to easily cut off his route. He was also responsible for the missed blitz pick-up that resulted in Carson Palmer’s first-half interception and injury, which effectively ended the game. On the ground, he had little room to run, earning more yards after contact (18) than official rushing yards (11) while forcing just one missed tackle. It was a rough day for the offensive line, as four-of-five starters gave up at least two pressures. Shipley was the lone lineman to post a clean slate in pass protection for Arizona, and his 69.8 run blocking grade, while not impressive, also bested the rest of the Cardinals offensive line. Peterson did not alllow a single reception on 40 snaps in coverage, and was targeted just once. That is now back-to-back weeks that he has not allowed a catch, and has given up just seven catches for 82 yards in seven games on the year. Bucannon was all over the field on Sunday as he made a game-high seven defensive stops. He was targeted a team-high 10 times and his seven catches allowed went for just 43 yards, a passer rating of 38.8, and picked off a pass where the receiver had gotten cut off by another defender. However, Bucannon also missed a tackle and was out of position a couple other times in run defense limiting his overall grade.